Jim and Jori’s Zero Step helps you focus your attention on your intention to connect, and then affirms your intention to live in the present. Listen in as they demonstrate the process — and learn about the benefits of using and cultivating it! Jim and Jori Manske went from poverty to financial independence in 8 years, and they’re making the process they used available to you! Please join them in this inspiring 8-session program to transform your relationship with money, scarcity and abundance. 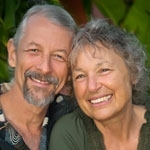 Jori and Jim Manske offer a process they call "The Zero Step," encompassing the characteristics of warmth toward self and other, care for the vitality of both yourself and other(s), wonder/interest, vulnerability and empathy, which leads directly to connection requestsand an openness to outcome. Join Jim Manske for practice exercises that will help you navigate away from reactivity toward a more compassionate way of being in the world.